As per usual, Tayna's service and prices were excellent. I've been dealing with them now for 20 years and won't be changing any time soon. 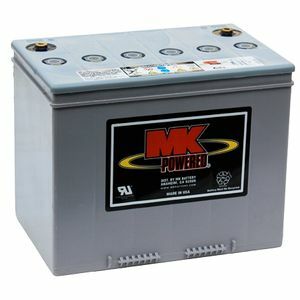 This is the first time I've used MK batteries, opting in the past to use Sonnenschein, 56 ah. Naturally, I expected an improvement in performance, given the difference in amps, but not on the scale that I have. No more worries over low battery signals! As someone else has already said, these are the largest batteries that will fit in a Quickie f 55s without a seat riser and having used them for the last couple of weeks, I can highly recommend. Very pleased with being able to buy such quality batteries ate sucha good price. Thye arrived quickly and were really well packed. Perfect for use on single seat ride on golf buggy. Arrived 11am next day. Pleased with the speed of delivery. Came the next day, instructions followed exactly, fully charged and installed immediately. Expensive, but that was the model needed, so perfectly happy with whole transaction. Highly recommended company. These are the biggest batteries that will fit in a Quickie F55 wheelchair. Compared to the old units these replaced, the torque and power is improved, and the range is MUCH greater - with average town use, the chair could now go 2-3 days without charging if necessary. Cheapest battery price on the internet. Service was friendly and informative. Delivery was next day (a.m.). Would definitely recommend and use Tayna again. Great service, no problem with batteries.